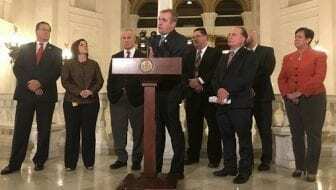 HARRISBURG, PA (WSKG) – As Pennsylvania’s 2017-2018 legislative session draws to a close, lawmakers are picking their leadership teams for the next two years. Their replacements are both from the southeast. Philadelphia’s Jordan Harris will take over as Whip, and Montgomery County’s Matt Bradford will helm Appropriations. Bradford most recently served as the Democratic head of the House State Government Committee. He agreed with Harris that the new slate of leaders brings needed “regional diversity, gender diversity, racial diversity,” and added that with more seats, he’s hoping Democrats can be more effective. Meanwhile, House Republican contests didn’t see any major surprises–but that doesn’t mean there won’t be changes. Cutler is taking over for Indiana County’s Dave Reed, who is now bowing out of politics after four year as leader.